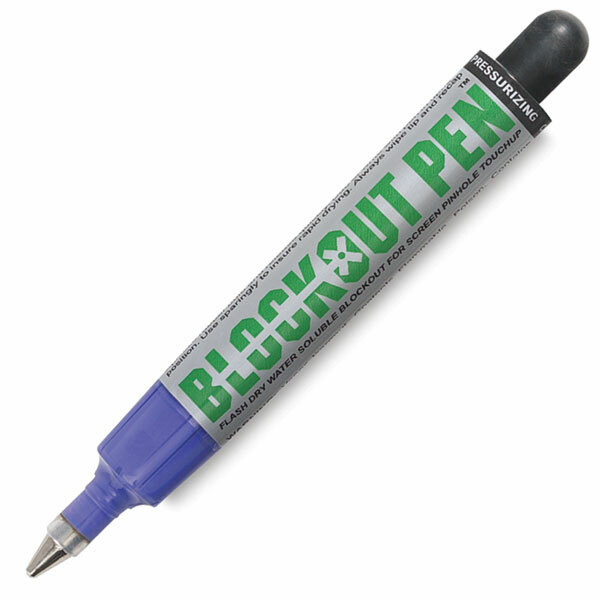 These flash dry blockouts in convenient pen applicators are for pinhole and general screen repair. Spotting pinholes and repairing minor screen breakdowns has never been easier. Blockout Pens replace masking tape as the quick fix for jobs in progress. Blocked out pinholes stand up to repeated screen wipings. Three color-coded pens are available, to meet different needs. Note — Always perform suitability and compatibility tests with the ink you are using before use in actual production. Red Pen — A fast drying, water soluble (10 to 15 minutes) blockout. Recommended for use during screen preparation. Works with all stencil systems. Resists virtually all solvent based, plastisol, and UV inks. Reclaims with tap water. Blue Pen — A quick drying (15 to 20 minutes) blockout. Recommended for use during screen preparation. Works with all stencil systems. Resists water based, plastisol, UV, and some solvent based inks. Reclaims with stencil remover. Green Pen — An ultra fast drying, water soluble (30 to 90 seconds) blockout. Recommended for on or off the press touch-up of direct stencil systems. Resists plastisol, UV, and most solvent based inks. Reclaims with tap water. ™ Blockout Pen is a trademark.